From Novosibirsk, Russia, Roman Stolyar is a composer and free-improvisational musician who plays a variety of styles including intense and theatrical jazz, classical and progressive rock. The music on Credo includes recordings from 1996, and two different performances in 2000. The CD opens with the four part 35 minute "Credo RS", which is a self-portrait consisting of composed and improvised music recorded in 1996. "Introduction" is dominated by Stolyar's beautiful and expressive piano work which ranges from light melodies, to jazz, to Gershwin styled whimsy and intensity. In its last moments the music bursts into a full symphonic prog rock assault complete with Keith Emerson keyboards. I wish Stolyar would have developed this section a bit more. "In Jazz" opens with a recorder solo that would make Ian Anderson bow his head in respect. Percussion soon joins in and playfully duels with the recorder. And when the keyboards kick in we're in full orchestral/progressive/jazz mode that brings to mind a more tribal version of Shadowfax. Stolyar excels at thematic development and at all times I had the sense that a story was unfolding. Then he launches into a Dave Brubeck "Take Five" bit in which the recorder and piano duke it out and we find ourselves in full band cool jazz heaven. Very high volume and very intense. "In Quiz" features more jazz piano that has that wonderfully theatrical Gershwin style. Really fantastic composition and playing. And "In The Reality" is a flowing symphonic electro-acoustic piece with oriental, jazz and new age sounds, plus seductive melodies and arrangements and head bopping percussion. The next four tracks, "Songs Of The Season", are more recent recordings by Shanti, the duo of Stolyar and his sister Yelena Silantieva. A melodic progressive rock suite with beautiful vocals by Silantieva. The music makes the classic prog rock transitions through multiple themes as it works its way through the four seasons. We hear lush symphonic keyboards, lulling medieval motifs in which Stolyar's recorder fits in perfectly. Kind of a mixture of Vangelis, ELP, George Winston, early Genesis, and hints of jazz. On the closing track, "Meditation", Stolyar reveals his more experimental side. Krafterwerkian electronics and organ create a robotic melody alongside recorder (both meditative and fiery) and symphonics, making for a very intriguing combination. It's a nice piece though the rhythms are strangely off-kilter near the end and the track ends somewhat abruptly. 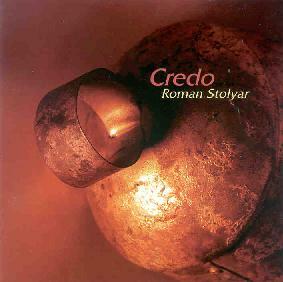 In summary, Roman Stolyar is a gifted musician and composer who clearly has a variety of stylistic interests, though the "Credo RS" tracks were the ones that excited me the most. I'd be very interested in hearing more of his music. For more information you can visit the Electroshock Eecords web site at: http://www.electroshock.ru.